CNN's Jim Acosta walks into federal court in Washington, Nov. 14, 2018, to attend a hearing on a legal challenge against President Donald Trump's administration. A U.S. federal judge has delayed until Friday a decision on whether the White House must, at least temporarily, allow CNN correspondent Jim Acosta back on the premises to do his job. U.S. District Court Judge Timothy Kelly has rescheduled a hearing for the case at 10am local time Friday. The White House Correspondents' Association (WHCA) filed a brief Thursday in support of CNN's Motion for a Temporary Restraining Order in the matter of CNN vs. Donald J. Trump, according to Olivier Knox, WHCA president. He said at Wednesday's hearing on CNN's motion, the Justice Department argued that the president has unbridled authority to pick and choose for any reason those journalists who might cover him. The WHCA brief highlight the danger posed to all journalists, and to the American public, if the President's claim is permitted to stand, Knox said. CNN lawyer Ted Boutrous told Kelly on Wednesday there were much more tailored ways for the White House to deal with Acosta, such as not calling on him at briefings. “Knowing President Trump, he’ll probably call on Jim Acosta the first day he gets his press pass back,” added the attorney. CNN's Jim Acosta goes through security as he enters the federal court building in Washington, Nov. 14, 2018. Government attorneys contend Acosta's conduct prevented the White House from conducting an orderly news conference. "A single journalist's attempt to monopolize a press conference is not a viewpoint," argued Deputy Assistant Attorney General James Burnham, who told the judge that the suspension of Acosta's credentials did not cause the journalist immediate and irreparable harm which would necessitate a temporary restraining order. "As for CNN, I don't think there's any harm at all," said Burnham, noting the network has 50 other journalists with White House passes. The hearing on the temporary restraining order was the first in the lawsuit filed by the news network against President Donald Trump after the White House suspended the credentials of CNN's chief White House correspondent. "The President and White House possess the same broad discretion to regulate access to the White House for journalists [and other members of the public] that they possess to select which journalists receive interviews, or which journalists they acknowledge at press conferences," the Justice Department, on behalf of the White House, argued in a filing earlier Wednesday. Asked by the conservative Daily Caller website whether he expected to prevail in the lawsuit, Trump replied: "We'll see how the court rules. Is it freedom of the press when somebody comes in and starts screaming questions and won't sit down?" Several major news organizations, including Fox News which is generally viewed as supportive of the Trump administration — have thrown their weight behind CNN's legal effort. "Secret Service passes for working White House journalists should never be weaponized," FOX News president Jay Wallace said in a statement. "While we don't condone the growing antagonistic tone by both the President and the press at recent media avails, we do support a free press, access and open exchanges for the American people." A coalition of news organizations, including the Associated Press, Bloomberg, CBS News, NBC News, and newspapers the New York Times and USA Today, also announced they are filing "friend-of-the-court" briefs, known as amicus curiae, supporting CNN's lawsuit against the White House. White House press secretary Sarah Huckabee Sanders talks to reporters during a press briefing at the White House in Washington, Oct. 29, 2018. White House Press Secretary Sarah Sanders has dismissed the lawsuit as "more grandstanding from CNN," saying the administration stands by its decision to revoke Jim Acosta's credentials. 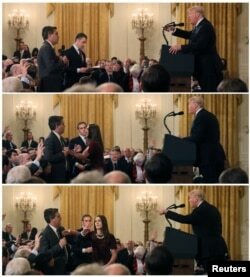 "After Mr. Acosta asked the President two questions — each of which the President answered — he physically refused to surrender a White House microphone to an intern, so that other reporters might ask their questions. 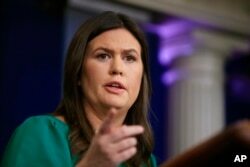 This was not the first time this reporter has inappropriately refused to yield to other reporters," Sanders said in a statement Tuesday. The Trump administration last week suspended Acosta's "hard pass," which granted him access to the White House. The suspension came after the reporter challenged Trump's portrayal of a caravan of Central American migrants as an "invasion." White House officials also accused Acosta of "placing his hands" on a White House press aide who had tried to take the microphone from him during the interaction. Video showed that Acosta was not aggressive with the aide. The press secretary's statement on Tuesday, however, made no reference to the previous White House accusation that Acosta had placed his hands on the young woman. A number of legal scholars predict, based on previous rulings, that CNN is likely to prevail — but they note the lawsuit is unique in targeting a serving president and White House staff. "If you're going to discriminate based on the content or the viewpoint of their questions or what they write, the courts are really unanimous on that point you can't do it He [the president] just can't do it." said Jane Kirtley, a professor of media ethics and law at the University of Minnesota, of the argument made by the government in its filing. "The court could bypass that question entirely and just say there's procedure here you needed to follow, and you didn't follow it," Kirtley told VOA. "The case is certainly unusual, but it isn't unprecedented," said Sonja West, distinguished professor of First Amendment law at the University of Georgia, noting a decades-old federal appellate court ruling that the White House could not exclude a reporter based on content. "They are trying to argue that the revocation of the pass wasn't based on Acosta's coverage, but there is a long history here of President Trump expressing hostility toward Acosta and CNN," West said.